DVD Synopsis: Herod, who is the King of Judea is driven crazy by endless invaders and his wife' infidelity. As I've already expressed in my write-up of Neil Marshall's Centurion, I'm a Roman history junkie, so I suppose it was only a matter of time before I got around to covering my first “Sword and Sandal” film. 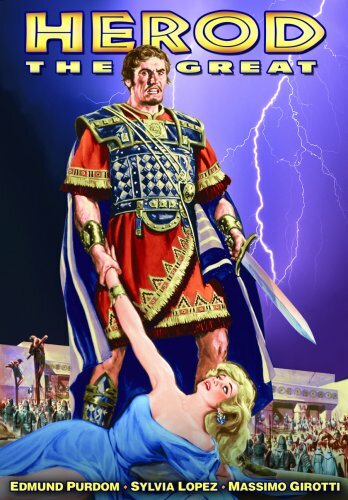 Produced in the late 50's and early 60's, the Sword and Sandal genre was Italy's answer to the epics Hollywood was turning out around this time, movies like The Ten Commandments and Ben-Hur. Though produced on a much smaller scale than their American counterparts, Sword and Sandal films still boasted elaborate set pieces, elegant costumes, and grand stories about characters who were larger-than-life. Herod the Great focuses on the tyrannical ruler of Judea who, history tells us, was notorious for murdering members of his own family. King Herod (Edmund Perdom) has just learned from his most trusted friend, Aron (Alberto Lupo), that his armies were defeated by the Romans at the battle of Actium. Knowing this means an end to his autonomous rule, Herod makes plans to meet with Octavian, the ruler of Rome, to try and save his kingdom. Before setting off for this meeting, Herod asks Aron to watch over his beloved Queen, Miriam (Sylvia Lopez), but places more than the queen's safety in Aron's hands. Fearing he may be killed by the Romans, and frightened of facing the afterlife alone, Herod instructs Aron to kill Miriam if he does not return, so that she may be with him forever. Days later, when news spreads that Herod is dead, Aron finds he cannot carry through with the king's request, and instead runs off with the Queen to hide her from her enemies. However, rumors of the king's death prove false, and when Herod returns, he finds a kingdom that has happily moved on without him. What he doesn't find is Miriam. As I sat watching Herod the Great, it became increasingly obvious to me that the spectacle and pageantry of this era in history were the driving force behind this film, certainly more so than the story, which is filled with backroom treachery, family squabbles and romantic intrigue. Now, to be sure, this was a time in history when treachery and intrigue were commonplace, especially among the ruling class. Even so, the events depicted in Herod the Great are closer to what you'd find in a television soap opera than any historical textbooks. The drama is incredibly over-baked, and much of the supposed “romantic” dialogue that passes between Herod and Miriam is, at times, downright laughable. No, it's definitely the spectacle that took the lead in this film; Herod's grand palace, the large crowds that gather outside to curse the king's tyranny, the amazing detail put into the various costumes, all proved much more impressive than the movie's narrative. Ultimately, I'd have to say Herod the Great is not a particularly good film, but while it may not have much to say about this chaotic moment in history, at the very least it gives us something interesting to look at. Aw no horror movie today, tis ok, I will be back tomorrow. My ears were whistling dixie on the last episode. Bought 2, Chain Letter & the Traveler, both scary and gory, loved them. I was going to get the reimagining of I Spit on your Grave cause of the ratings, but after I thought about it I was thinking I am a fan of the original and couldn't bear it. Lars: Thanks for stopping by, and for the comment. No horror today, but you'll definitely want to check back tomorrow (and the next day, for that matter...and maybe even the NEXT day). I'm glad to hear you enjoyed the recent episode, and CHAIN LETTER and THE TRAVELER are two good ones. Again, I haven't seen the original I SPIT ON YOUR GRAVE yet, so I did like the remake. But, from what Billchete and Gregamorits said (both of whom DID see the original), it seems like you're making the right choice for yourself.